Home NEWS One dead, 17 injured in accident near Blue Post. The ill fated matatu that claimed one life and several others injured in the Tuesday morning accident along the Nairobi-Nyeri Highway. One person died on Tuesday morning after the 14-seater matatu they were travelling in was involved in an accident with a canter lorry near the Del Monte kiosk along the Nairobi-Nyeri Highway. 17 others, 3 of them in critical condition, were rushed to the Thika Level 5 Hospital with multiple injuries. According to the medical superintendent Dr. Peter Patrick Nyaga, the dead man succumbed to his injuries as he was being treated to multiple injuries in the head, thorax and the limbs. “This morning at around 8am, we received 18 patients who were involved in an accident near Blue Post Hotel. One has succumbed to his injuries, with 3 in critical but stable condition,” explained Dr. Nyaga. 10 others were treated with various injuries, 8 of whom were admitted to the general wards. Preliminary reports indicate that the accident occurred at around 7:30am when the matatu hit the canter head-on as the lorry attempted to cut through the main highway onto the Del Monte road across the other side of the highway. “Our initial investigations show that the canter attempted to cross the road and came to the way of the matatu that was heading to Thika. 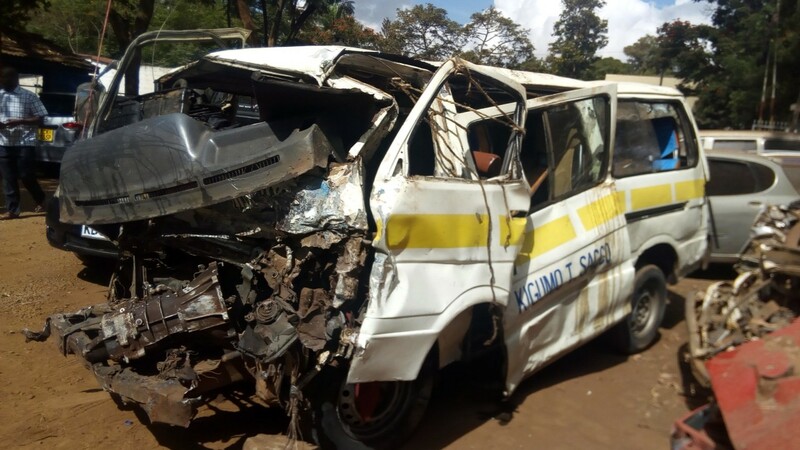 The matatu hit the lorry, pushing it to roll on its side before it followed suit and rolled over to crash-land on its front part,” said the Thika OCPD Willy Simba. The matatu was carrying 13 passengers at the time of the accident and was heading to Thika from Kagundu-ini area of Murang’a County. Those who were critically injured included the driver of the matatu and the two passengers who were seated next to him. The canter was on its way to Nanga in Ithanga location of Gatanga Constituency from Gatanga and with 5 people on board, 2 women and 3 men. All the occupants of the lorry survived with minor injuries, mainly bruises and cuts. The area where the accident occurred is a black spot where so many people have either been maimed or killed over the last few years. It is supposed to serve as an exit route into the highway for motorists leaving Thika Sports Club towards Thika town or to Nairobi. It also serves as the link to the Del Monte road for motorists from Gatanga. Heavy lorries are also known to use this junction as they head to Del Monte area to collect building stones and sand from the lower parts of Murang’a and Ukambani. Of late, it has become a popular exit route for PSVs going to Thika from Nairobi as they U-Turn at the spot to avoid the Ngoingwa flyover during the rush hours when traffic is heavy. It is also a darling of PSVs heading to Ukambani region via Del Monte road as they evade the Makongeni traffic jams. This has made it very risky as it is in the middle of the highway with vehicles from Murang’a and other Mt. Kenya areas are known to over speed in that stretch of the highway.